Specifically designed to follow the contours of the female body. The Scia jersey is engineered with lightweight melange fabric to ensure supreme breathability and comfort. Perfect fit thanks to the bodyfit fabric on the neck and sleeves, it adheres to your body without constraining. Specifically designed to follow the contours of the female body. The Scia jersey is engineered with lightweight melange fabric to ensure supreme breathability and comfort. Perfect fit thanks to the bodyfit fabric on the neck and sleeves, it adheres to your body without constraining. Silicone gripper at the base to keep the jersey in place at all times. Carry everything you need for a day in the saddle in the triple back pocket. 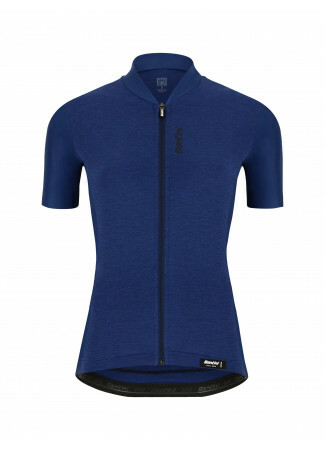 Complete with a stylish reverse coil coloured zip to complement jersey design. High performance cut with inner silicon grip at the base. Made with lightweight mélange fabric to ensure supreme breathabilty. Carry everything you need on the bike. Beautiful colour and great fit. Enjoy the collar, as the style doesn't bother if its fully zipped up. The sleeves are a little short for my liking and you definitely need to order a size bigger (if you're a small, a medium already sits tight). Otherwise - great quality!